Did you notice a flyer in your mailbox last week with this cute food bank cartoon above? I didn’t either – but I did notice my Letter Carrier’s t-shirt today, and she was kind enough to pose for me to take this photo and share the message. For the past 25 years on the second Saturday in May, Letter Carriers across the Country volunteer to pick up non-perishable food and deliver to community food banks, pantries and shelters. 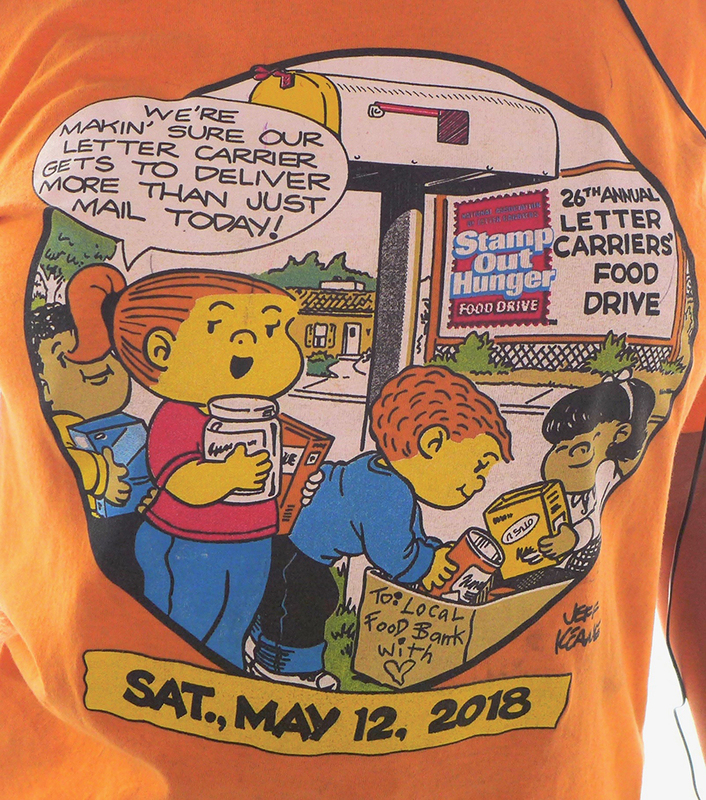 The Letter Carriers’ ‘Stamp Out Hunger’ Food Drive is an outgrowth of the National Association of Letter Carriers’ tradition of community service, and will be held on May 12th. Leave non-perishable food items next to your mailbox, or in a box provided by your building, and your Letter Carrier will do the rest.